Mercedes continued their 100% start to the 2019 Formula 1 season last time out, with Lewis Hamilton stepping on the top of the podium in Bahrain. 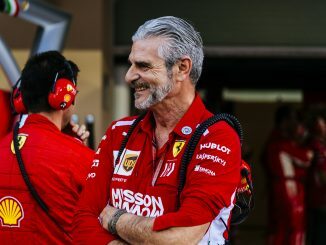 Ferrari’s Charles Leclerc will be looking to make up for the race in Sakhir, having clearly had the fastest car only to be let down by mechanical issues late on. Four drivers on this year’s grid are previous winners in Shanghai, but Hamilton is the only one to have more than one Chinese Grand Prix victory to his name. 3Legs4Wheels looks ahead to F1’s 1000th race. Sebastian Vettel started the race on pole position looking for his third win of the season, but he was undercut by Valtteri Bottas in the pitstops, leaving him chasing the race. 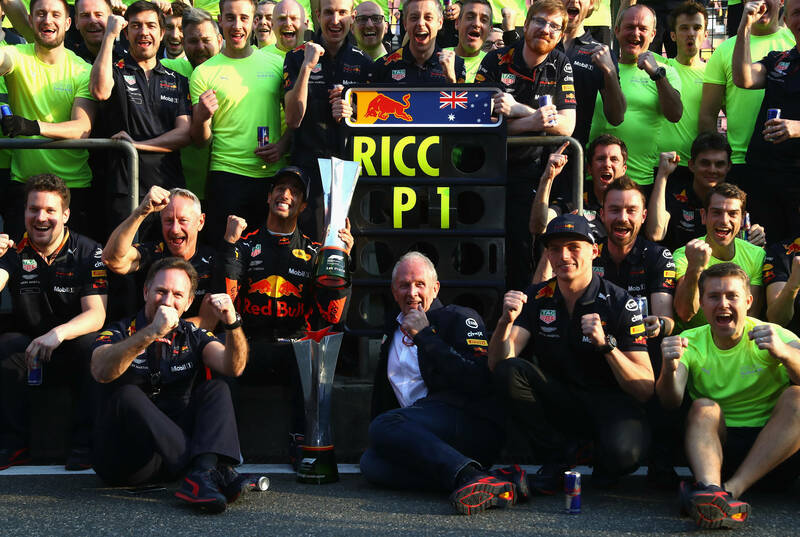 A safety car period caused by the two Toro Rosso drivers collided allowed the Red Bull drivers to come in for fresh tyres, leaving Daniel Ricciardo and Max Verstappen quick on the restart. Verstappen pressured Vettel for second, but the two came together, causing damage to the Ferrari and dropping the German down the order, while the Red Bull driver was handed a penalty, promoting Ricciardo. The Australian was quicker and soon managed to get past Bottas for the lead with 10 laps to go, securing victory despite starting from sixth. The 5.451km or 3.388-mile circuit, which has been on the F1 calendar since 2004, is made up of 16 turns. The Shanghai International Circuit hasn’t undergone too many changes over the years, while Michael Schumacher’s fastest lap from the inaugural race still holding the race lap record. Like this year, there are two DRS zones for 2019, both towards the end of the lap heading into turn 14 and just after turn 16. Shanghai is one of the circuits that tends to be affected by the weather conditions, with cooler temperatures and rain having had an impact in previous editions of the Chinese Grand Prix. 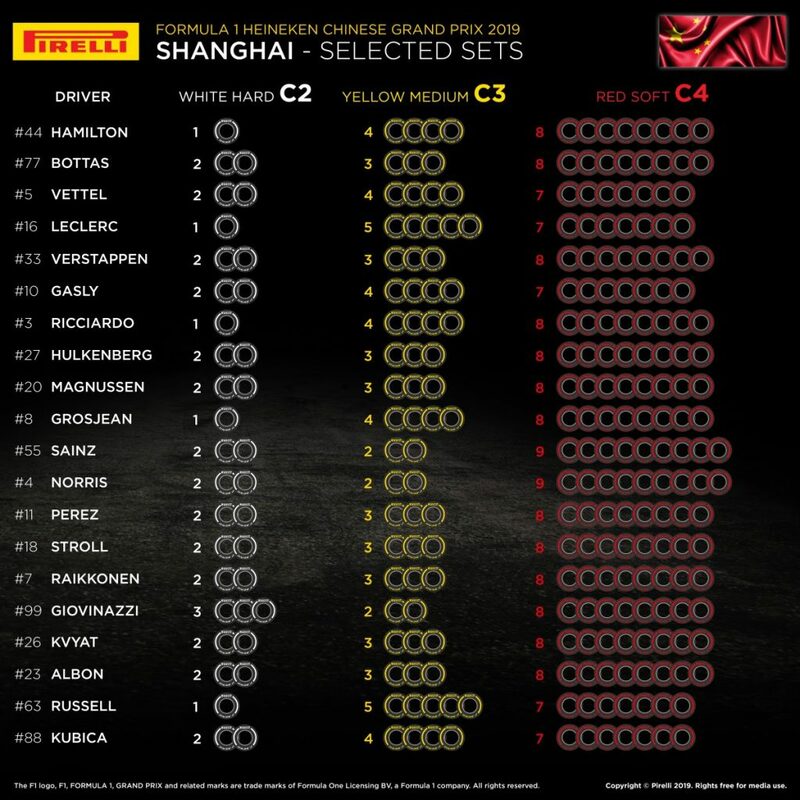 Pirelli will bring the same compounds that were in use for the Australian Grand Prix to this race – C2 as the hards, C3 for mediums and C4 as the softs. McLaren will be able to use more sets of the softs than any other team on the grid, having selected nine for each driver, while Ferrari, Williams and Pierre Gasly all appear to have taken a more conservative approach. 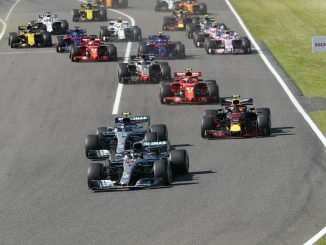 A range of strategies could be in use during the race, with just three teams giving both drivers the same allocation and six different combinations being used by the 20 drivers. 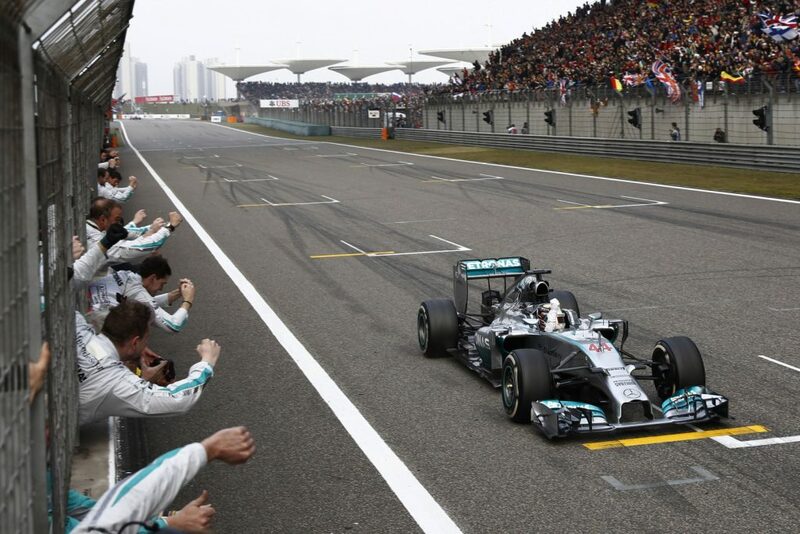 The Chinese Grand Prix has thrown up some entertaining races over the years, including the final win of Schumacher’s career. Another memorable drive came from Jenson Button in 2010, just a few races into the then-reigning champion’s McLaren career. His teammate, Lewis Hamilton, was in pursuit for much of the race as Button had opted to stay on intermediates during a wet period. Despite finishing the race on well worn tyres and coming under pressure from Hamilton, Button nursed the McLaren around to secure a narrow victory ahead of Hamilton. That race weekend also saw another memorable, if slightly less celebratory moment. It was that race which saw Sebastien Buemi’s Toro Rosso suffer a massive suspension failure, shedding both front wheels simultaneously, and becoming one of the most GIFfed moments from F1. The big stat – well obviously it’s the 1000th championship points scoring race in F1 history. Keep your eye out for a few helmet and livery variations this weekend as many drivers and teams mark the occasion. Kimi Raikkonen won’t be one though, as he revealed in the drivers’ press conference that he’d asked to have an open-face helmet for the milestone, but regulations wouldn’t allow it! His team, Alfa Romeo, are the only manufacturer on the grid today that were involved in the first race at Silverstone in 1950. Hamilton is one of only three drivers to have won more than once in Shanghai, and the other two – Fernando Alonso and Nico Rosberg – aren’t on the grid this year. The reigning champion is also the only driver to have more than two wins in Shanghai, taking the win on five occasions, including three of the last five. 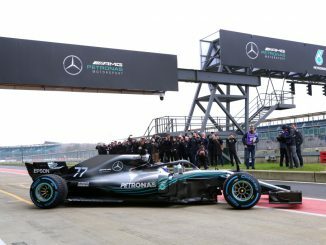 Mercedes certainly like this track, having won four times in a row between 2014 and 2017, but they come unstuck last year as Bottas lost out to Ricciardo in the closing stages. 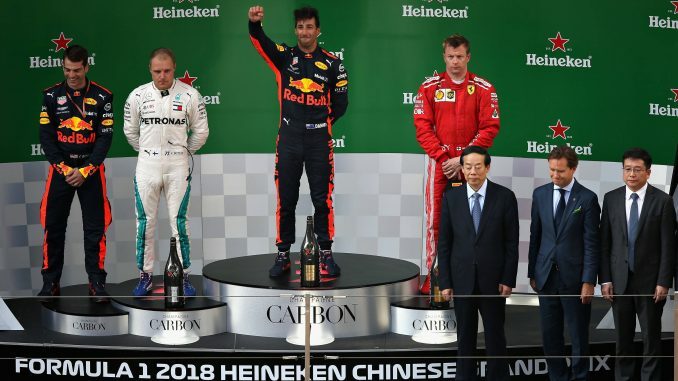 It is possible to overtake in China, as Ricciardo proved last year. 2016’s race still holds the record for the most overtakes in a dry race with a mighty 128, and with the increased impact of DRS and the aero changes for this year, there could be plenty of on-track action this time out. Despite this, the pole-sitter has a good record at Shanghai, winning nine of the previous 15 races. Despite showing promising pace, particularly in Bahrain, Carlos Sainz hasn’t finished a race since joining McLaren. He’ll hope that changes here, as he’s taken points on his three previous trips to China, while Sergio Perez also has a strong finishing record at Shanghai, having never failed to see the chequered flag in eight previous visits. You can check out our podium predictions for this weekend’s race and let us know who you think will be in the top three by taking part in our prediction league. Join us during qualifying and on Sunday for our live blogs, and tell us what you think of the action via Twitter or Facebook. If you haven’t already, you can listen to more of our thoughts ahead of the 1000th race on this week’s podcast.